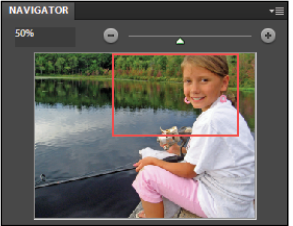 The Navigator panel is a tool for monitoring an image; it also makes it easy to zoom and scroll in the image. The usefulness of the panel is that you can keep the current tool active, and, at the same time, zoom in and out of your image. Dragging the red frame to the area you want to see allows you to quickly scroll around the image, and is quicker and more efficient than trying to use the vertical and horizontal scroll bars. In this next exercise, you will work with controlling the Navigator. 1 Choose Window > Navigator to open the Navigator panel. 2 Click an image to select it, then use the slider in the Navigator panel to adjust the zoom level in of image. After adjusting the zoom level, review the results. Dragging the slider to the right will make the red square smaller. When you do this and place your cursor in the middle of the square you will see a hand icon ( ) displayed. Click and drag the square around the image to reposition the zoom area. This is especially effective when retouching an image at a high zoom percentage. Instead of zooming out of the image to see where you are, in order to move to a different spot, you can utilize the Navigator’s thumbnail and red square to guide you to a different spot. Another useful navigation tool is to select the Hand tool () and click an image to make it active. If you hold down the Shift key while dragging on that active photo, all four images will be repositioned consistently! All four images are tiled to the screen. 3 Choose File > Close All. If asked if you want to save the changes, press Yes. 1 Press the Organizer button ( ) at the top of the workspace on the menu bar. The Organizer opens. 2 Locate the file named under_exposed.jpg, and select it. The image is too dark, and you’ll use Guided Edit mode to correct the image. 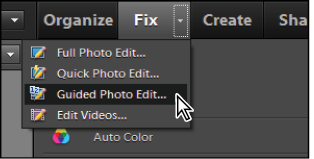 Click the Fix tab at the top of the workspace, then click the triangle to the right of the tab and choose Guided Photo Edit from the menu that appears. The image opens in the Editor and the Guided Edit panel asks you how you would like to change this image. Choose Guided Photo Edit from the drop-down menu. 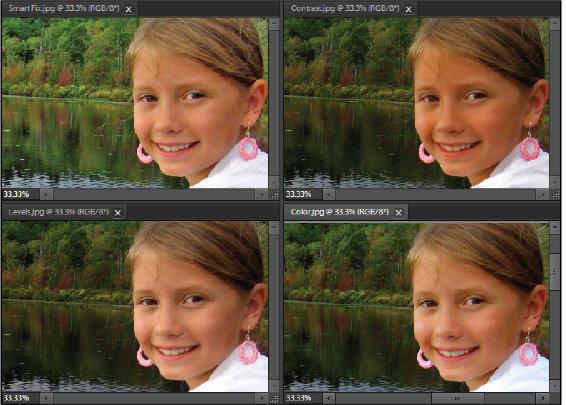 3 In the Color and Lighting section in the Guided Edit panel, choose Lighten or Darken. The Guided Edit panel changes to reflect the Lightening and Darkening options. 4 You can click the Auto button to see if Photoshop Elements can automatically fix the file for you. You’ll see that the image actually gets darker. This image needs some additional help. Undo the Auto change by pressing the Reset button located toward the bottom of the panel. Now you can use the sliders to manually lighten the photo. There are three sliders in the Lighten and Darken section. The first slider lightens the shadows, or the dark area, of an image. The second slider darkens the highlights, or the lightest part, of an image, and the third slider affects the medium to bright parts of the image, which is everything in between light and dark. 5 Drag the Lighten Shadows slider to 20. The image now regains detail in the shadows. 6 Leave the Darken Highlights settings at their defaults, and drag the Midtone Contrast slider to the left to decrease that value to -9. 7 To compare the changes you made to the original image, press the After Only button at the bottom of the Guided Fix panel and choose Before and After - Horizontal. 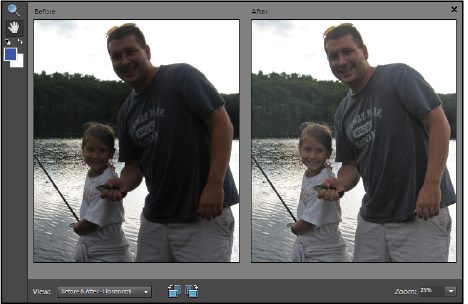 You can now see the before and after versions of your image. Before and after the Lightening options. 8 Press Done once you are happy with the changes. 9 Choose File > Save. In the Save As dialog box, type under_exposed_working in the Name text field and change the format to Photoshop. Press Save. 10 Choose File > Close. If you are asked to save changes, press No. You are returned to the Organizer. You can now see how Guided Edit mode helped lighten this underexposed image.